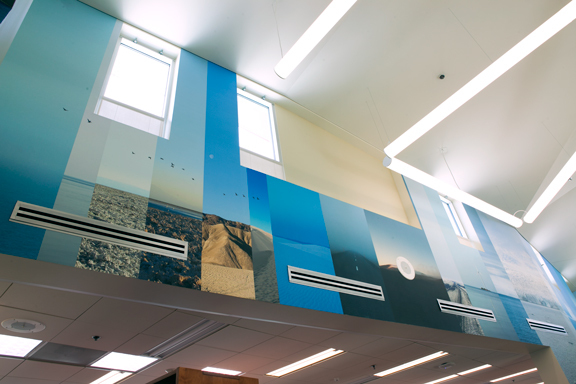 The Los Angeles County Arts Commission commissioned me to make a site-specific civic artwork for a newly built public library in Pico Rivera. The two artworks I created consider the library’s role as a vehicle for exploration and discovery that lead to a journey into knowledge. I focused on bird migration as a metaphor to represent the spirit of a wide open world available for all to explore and experience. I was inspired by Pico Rivera’s Rio Hondo Coastal Basin Spreading Grounds, which offer a resting spot for a diverse range of migratory birds passing through, returning season after season. In the middle of our metropole, tundra swans from the High Arctic have been spotted in January, Bald Eagles in February, and so on; migrants who are free to come and go. 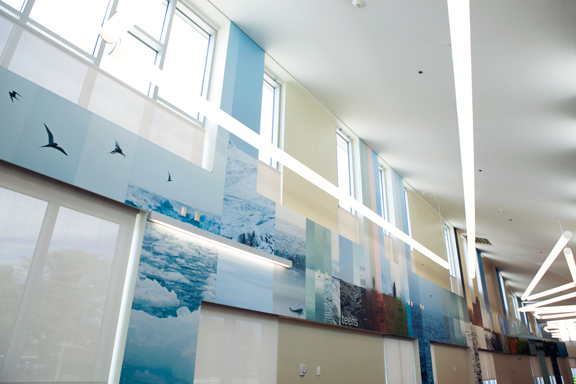 On the north wall of the library a photographic mural of 132 feet length depicts (from left to right) our planet from the 90° North Pole to the 90° South Pole, and the different land—and seascapes one encounters in between. Titled CircumSolar, Migration 2, the artwork is dedicated to the voyage of the arctic tern, the world champion in long-distance migration. It is my intent for these artworks to inspire the Pico Rivera community to learn and to imagine through exploration and discovery; to see that the world of knowledge is infinite with no boundaries; to feel connected to this community and to the planet as a whole. CircumSolar, Migration 2, 2013. 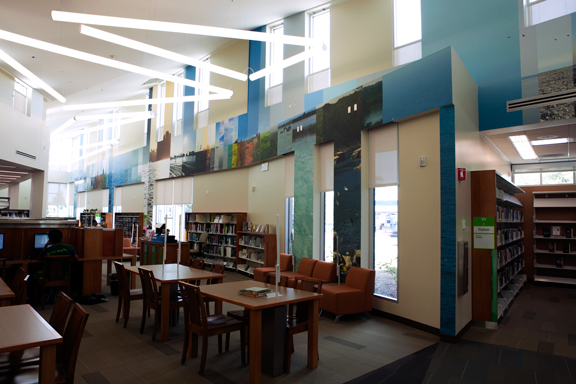 Public art at the Pico Rivera Public Library, commissioned by the Los Angeles Arts Commission. Mural. Fire retardant canvas and ink. 132 ft. long x 25 ft. high. ~1,250 sq. ft. approximately.